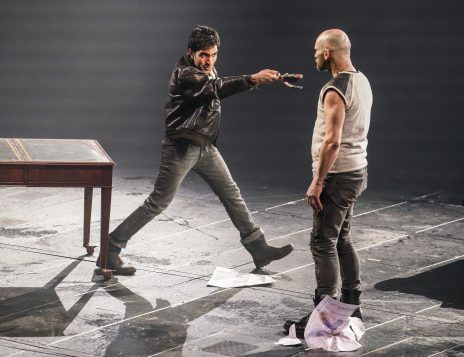 Having struggled to fill the, admittedly daunting, Olivier stage last year with Common and Saint George and the Dragon, two ambitious but ultimately disappointing pieces of new writing, Rufus Norris has turned to Shakespeare for salvation. 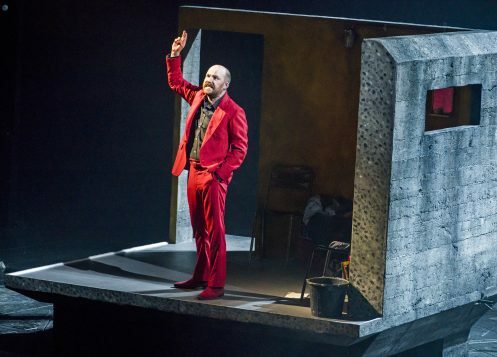 Norris has made the Olivier’s size and height work to his advantage in the past (in his 2015 production of Everyman for example), but this is one of the more aggressively ugly productions to be staged at the theatre in a long while. It’s set in a post-apocalyptic wasteland, one frustratingly stripped of geographic specificity. Where are we exactly, what sort of society is this and how did people end up here? It’s never made clear – conceptually, it’s a dismaying muddle. The world appears to have been ravaged by war. Life often ends suddenly and bloodily and the severing of heads is commonplace (the props department must be awash with them). The characters live in shabby bunker-like structures, remnants of the world that was. They wear improvised cardboard-and-packing tape breastplates, hats made from carrier bags, pleather and fishnets (evidently the hosiery of choice for dipsomaniac lady cutthroats). Knives are their weapons of choice. 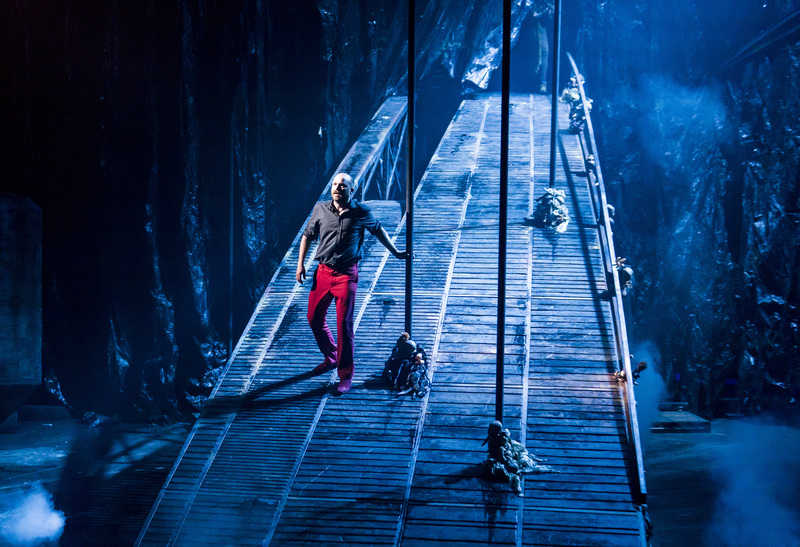 Designer Rae Smith has built a great gangway that swoops across the stage. It is dotted with spindly plastic-fringed sticks that look a bit like the spikes that adorn a traitors’ gate. A vast curtain of bin bag stalactites frequently descends from the ceiling. The whole thing is steeped in a permanent soupy gloom by lighting designer James Farncombe, while the sheer amount of plastic on display is suggestive of environmental catastrophe. 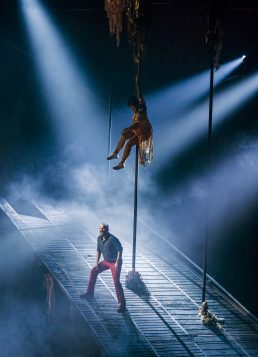 For the purposes of this production, the Olivier has been turned into a Thunderdome peopled by escapees from Joel Schumacher’s Gotham City. It’s Waterworld sans water. Rory Kinnear battles valiantly against the relentlessly grim aesthetic. 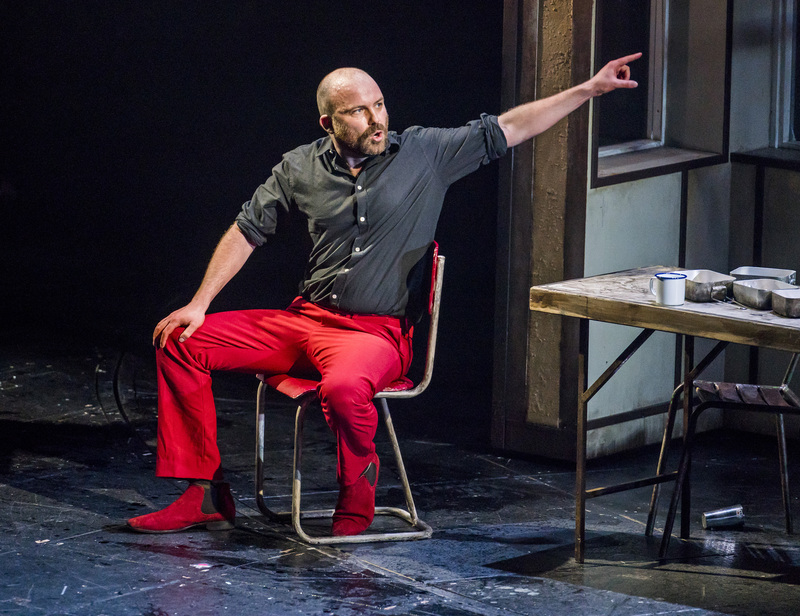 He can be a compelling, intelligent Shakespearean actor; in the past he’s been an eloquent Hamlet and a bullish, envy-drenched Iago. He tackles Macbeth with the same clarity of delivery, but he never digs beneath his skin. There’s little sense of spiritual turmoil. He delivers the “is this a dagger” soliloquy like a man trying to decipher a magic eye picture. 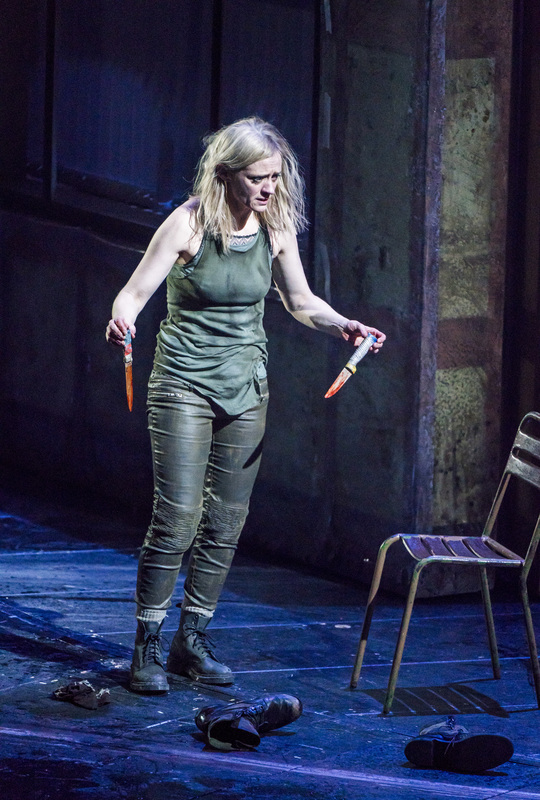 Anne Marie Duff’s Lady Macbeth is, if anything, even less well served by the production. Capable of conveying raw, undiluted emotion, she’s suitably intense but she never seems to connect with Macbeth. There’s little sense of heat between them, little that suggests her hunger for power. For someone who can be so forceful on stage, so present, she feels wasted here. 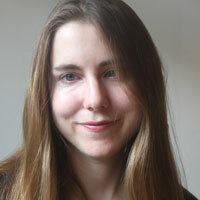 Norris’ production is not one of delicacy. It allows little room for emotional light and shade. He seems to have decided, on this occasion, that the best way to fill this unwieldy space is to have the cast run around a lot. During the opening scene one of the poor twitchy witches is made to sprint in endless circles. Norris does love a rave scene though, and he includes an incongruous party sequence in which a makeshift generator is fired up, the stage is decked out with fairy lights, and everyone has a bit of a bop. Bodies throb, arms are waved, and someone wears a cardboard box on their head for larks. But while it is one of the few moments when the production judders into a sort of awkward life, it feels tonally out of keeping with the rest of the piece. The descent into horror that marks the second half of the play contains a couple of effective moments. 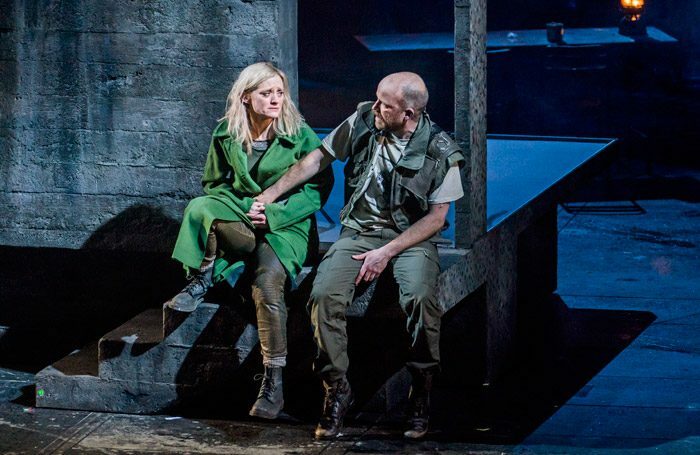 The sight of a blood-bathed Banquo staring accusingly through grubby glass at Macbeth is reasonably unsettling. But the sequence in which Kinnear is haunted by a procession of figures in red – a natty red jacket seems to be a symbol of status in this world of greys and greens – wearing wonky-eyed masks on the backs of their heads is more daft than uncanny. It’s soon supplanted in this regard by the final Birnam wood tableau in which the witches dangle in mid air from their sticks, looking like unholy pole dancers riding malevolent mops. Among the supporting cast, Trevor Fox draws a few laughs as the Porter, and Stephen Boxer as Duncan, Kevin Harvey as Banquo, and Patrick O’Kane as Macduff, all do their best to bring depth to their roles, but they have their work cut out for them. Norris can do spectacle but he hasn’t directed Shakespeare in years and, quite frankly, it shows. The substance of the play gets suffocated and though it runs to a little over two and a half hours (noticeably shorter than the originally advertised running time), it feels dispiritingly slow in places. Despite the blood and gore – not one but two decapitations plus an abundance of spewing and screaming – it ends up feeling a bit anaemic and utterly denuded of magic, rough or otherwise.